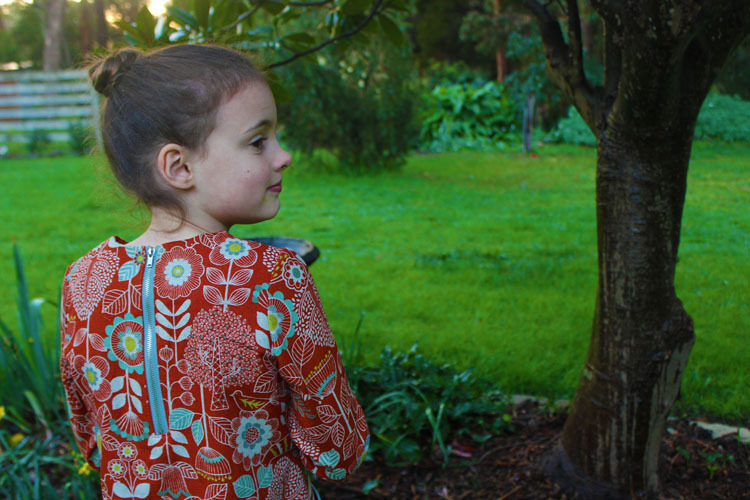 Today I am excited to share more photos and details and also invite testers for my newest pattern, the Cosmo dress! 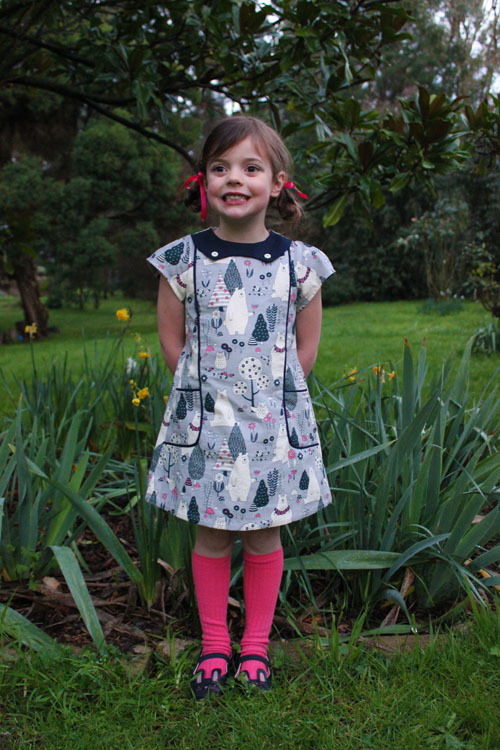 I designed the first prototype of this dress late last year but it was pushed aside by other projects until a couple of months ago when I developed it more, added more options and began testing the pattern. The Cosmo dress is semi-fitted A-line silhouette with a pieced front and side pockets. The front dress seams and pockets can be piped or left plain. Three different half collar options can be added at the neckline. The dress closes with an exposed zipper at the back, which gives the dress a modern edge. The dress is unlined, but rather finished with facings. The dress can be made sleeveless, with pleated short sleeves, flutter sleeves or plain three quarter or long sleeves, making the dress wearable in any weather. The Cosmo dress also lends itself to some creative colour blocking! 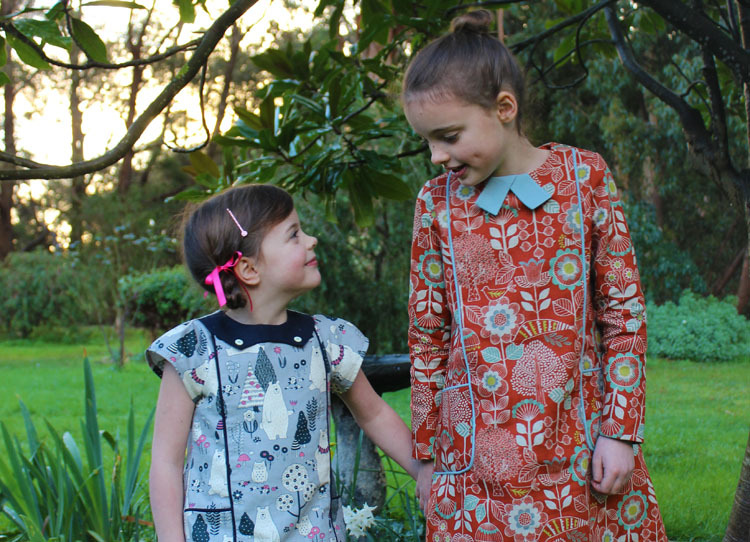 These dresses are both made in fabric designed by Cosmo. 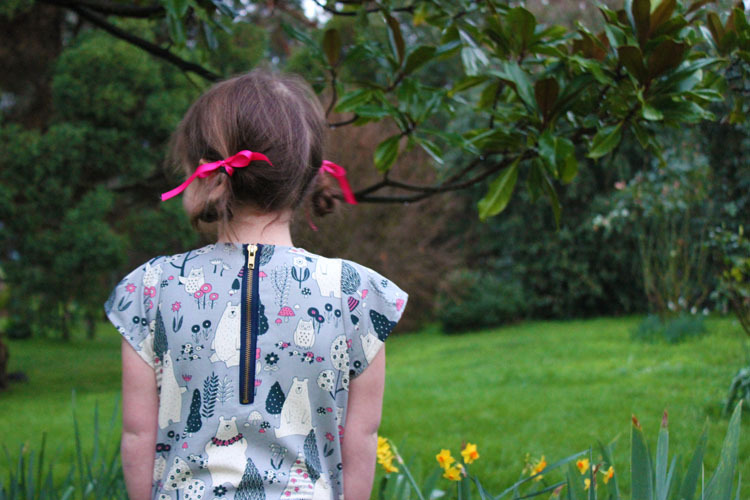 The grey woodland fabric was purchased at Spotlight and inspired the name of the pattern. The gorgeous brown cotton linen was a gift from Kawaii Fabrics. Kawaii not only generously gifted me the cotton canvas I used for this coat, but also this beautiful floral. I felt like the brown Kawaii floral was a good match with the grey bear fabric without being too 'matchy'. I also could have chosen this fabric, or this, or this, or this...... So many lovely choices, which would all make gorgeous Cosmo dresses! Kawaii also offer really great shipping rates with minimum spends qualifying for free shipping - often the shipping is what makes shopping on line less attractive, but fill your cart for the equivalent of $100 AUD and the shipping is waived. Win!! 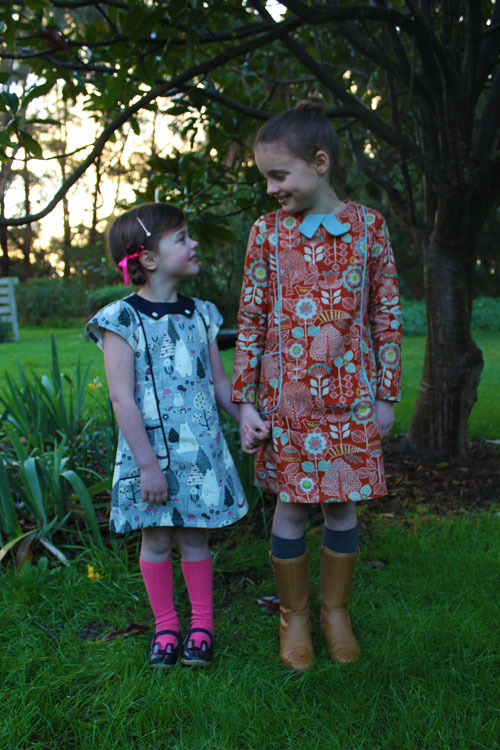 Thank you Maggie and Kawaii for the gorgeous fabrics! I can certainly recommend Kawaii to all of my readers! The Cosmo dress also features an exposed closed zip at the back. This means the back dress is cut on the fold, instead of two mirrored pieces. If you haven't sewn an exposed zip before, don't be afraid! It is very straightforward and just requires some care and some accurate pining! I am working on a video currently that will be available to view when the pattern is released to guide you step by step if you need further clarification aside from the written/photographic instructions. 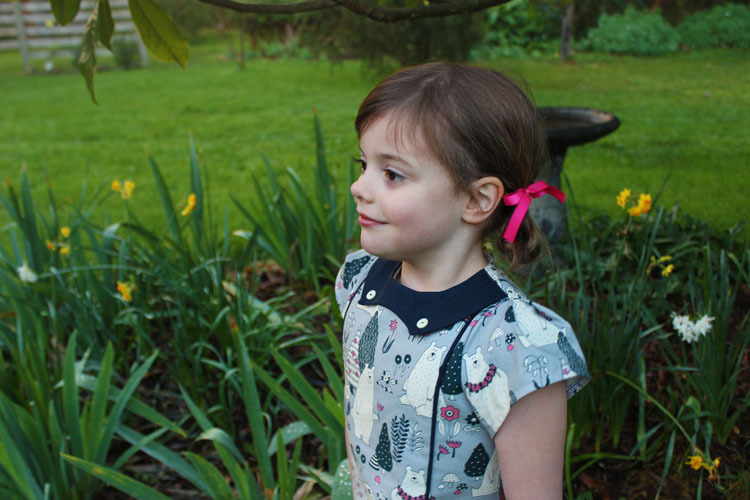 Emily's dress features the pleated short sleeves and sailor collar. 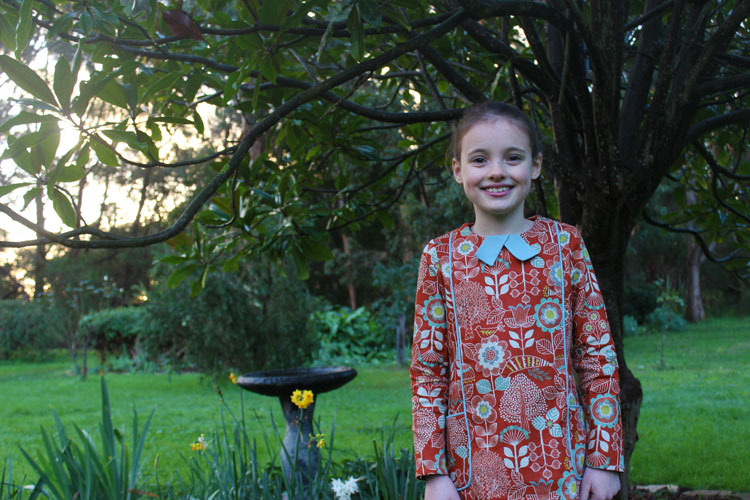 While Isabella's dress features long sleeves and the tie collar option. As you can see in the opening pattern cover pic, there is also another collar option that I will show you in the coming days. My new friend Marjolein from the lovely blog and IG account: Flaflinko helped me with sewing the sleeveless view and will also be sharing her gorgeous dress soon! So make sure to follow her to see! 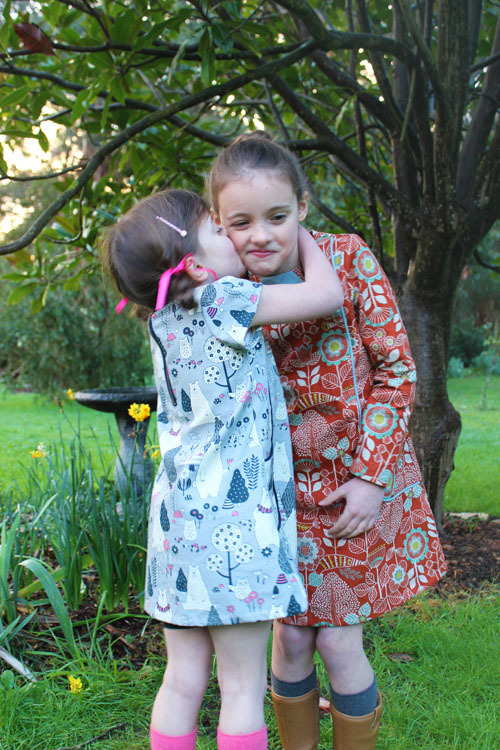 I asked for Marjolein's help for three reasons...1/ She lives in the Northern Hemisphere (Belgium) so her daughter is more likely to get wear out of the flutter sleeve dress at present, 2/ I love her style, and 3/ It is much more fun working on a pattern with a friend! As I discovered working with Jill on the Juliette pattern! Thank you Marjolein! Would you like to apply to test the Cosmo dress? Testing will begin this Friday 21st July and finish on Saturday 29th July. Please only apply if you can commit to this time frame. You can complete the application HERE. Edit (20/7/'17) -TESTING APPLICATIONS ARE NOW CLOSED. Thanks for applying! Looks like a georgeous dress but unfortunately I already committed to test another top / dress pattern in that time frame. Maybe next time? So lovely. This is going to be amazing! Damn... I'm to late... Maybe next time? 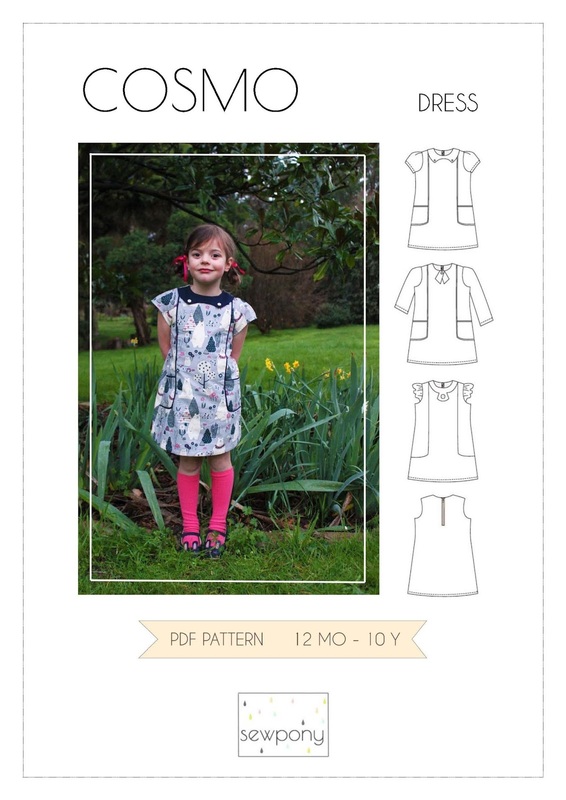 I am so excited about this pattern, it is the most interesting dress pattern I've seen in PDF-pattern-land for ages! It reminds me of school uniforms, in a good way. My school didn't have a uniform when I was growing up so I always coveted them!